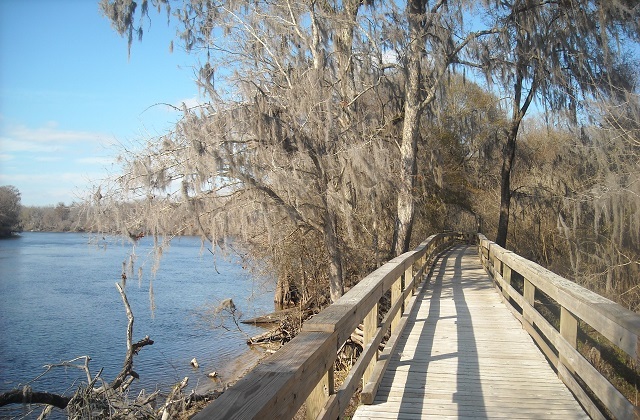 Hart Springs Park offers a wheelchair-friendly, 0.5-mile boardwalk through bald cypress trees along the Suwannee River. Wood Stork, Pileated Woodpecker, Prothonotary Warbler, Barred Owl and Bald Eagle are possible; common wading birds include White Ibis, Snowy Egret and Great Blue Heron. Red-shouldered Hawks nest here each spring, and Swallow-tailed and Mississippi Kites can be found in summer. Look and listen for songbirds like Acadian Flycatcher, Yellow-billed Cuckoo and White-eyed Vireo hidden in the foliage; fall is good for wood-warblers with Worm-eating, Kentucky, Blackburnian and Canada among the many species recorded here. Limpkin, Short-tailed Hawk, West Indian Manatee and Bobcat are sighted in the park on occasion. Trails through thick xeric hammock lead to some open areas good for Eastern Meadowlark and Northern Bobwhite. This family friendly park has a variety of camping and lodging options available. For paddlers, this park is a stop on the Gilchrist Blueway Trail and the Suwannee River Wilderness Trail.